Arson is suspected in a one-alarm fire at a storage unit in downtown San Jose, officials said. 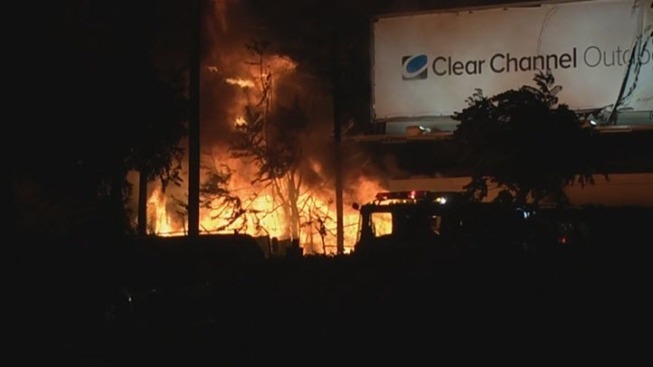 The fire was also outside a carpet business and damaged a nearby billboard just outside downtown San Jose late Thursday night. Crews responded to a report of a building fire at Off Price Carpet Outlet at 1020 W. San Carlos St. around 10:45 p.m., fire Capt. Tim Miller said. When firefighters reached the scene, they saw a large pile of carpet in an outside storage unit adjacent to the building in flames, Miller said. The blaze spread to a billboard directly above the storage unit, according to Miller. The fire didn't spread to the building's interior and was under control about an hour later, the captain said. PG&E personnel responded to the scene where they repaired power lines damaged in the fire, Miller said.